Deluxe Racing Pyrometer (54005) JOES Racing Pyrometer is designed for the rigors of racing. Covered with a rubber boot to protect your investment and maintain accuracy. Oversize numbers are 1-1/2 inches tall and the backlight makes for easy night use. The auto shut off keeps the battery fresh. 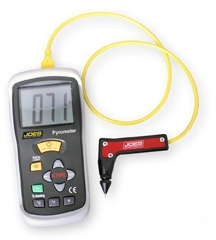 The JOES 90 degree probe is compact to get into the fender well with ease. The 90 degree design fits great in your hand for quick readings and the probe tip is adjustable so you can set it to get down to the cord on the tires you run.